Need a few last minute school supplies? Don’t miss out on these hot deals this week (August 13-19) at Office Depot! *Or you could add on a $4 item…to get to $6 back! It’s Back to School season…and no matter what the grade, chances are the kids need glue sticks. 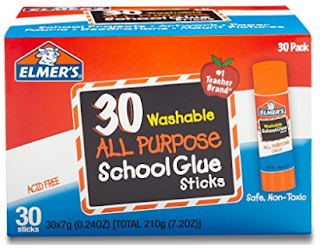 Amazon has this 30pk of standard, .24 oz glue sticks for just $7.88. *Amazon prices are subject to change. Here are some of the Back to School deals you will find at Office Depot and OfficeMax this week. Keep in mind I’ve found that some deals will vary per store, so always check your local store ad before you head out the door. Here’s a look at this weeks Back to School Deals at Target! Back To School Price Comparison Through August 24th! Here’s a look at the best deals this week on Back To School items. *If you don’t have children in school it’s a great way to grab some of the under $1 items and donate. To view a PDF file you can try HERE and to see all Back to School Deals visit HERE! *You will need to answer what is on the top of your Back to School List, share on your FB page and your $5 credit will be added to your account! Hurry – quantities are limited! Fine Print: Upon completion of the “Share & Claim” action, a $5 off $25 or more promotional credit will be automatically applied to your Amazon account. Promotional credits must be redeemed by 11:59 PM PST on Thursday, August 22, 2013. This promotion is available to customers located and with billing addresses in the United States. The promotional credit may only be applied to physical products shipped from and sold by Amazon.com, and excludes Kindle devices, digital downloads and gift card purchases. Limit one promotional credit per customer. Quantity is limited. Zulily 72 Hour Sale + 10% Off Back To School Items! Starting today thru August 18th, Zulily is giving an additional 10% off your $60 or more purchase on their Back To School Sale when you use the promo code SCRTSALE54 at checkout. Zulily RARELY offers promo codes and items are already selling out so shop early for the best selection in your size. It’s BACK! Hurry over and check out the Giant School Supplies Bundle on sale today for $19.99 (Retail $69.99)!